Thor is the blood-son of Odin, All-Father of the Asgardians, and Jord, who was also known as Gaea, the goddess who was one of the Elder Gods. Odin sought to father a son whose power would derive from both Asgard and Midgard (as the Earth realm is called by Asgardians), and hence he sought to mate with Jord. Odin created a cave in Norway where Jord gave birth to Thor. Months after the infant Thor was weaned, Odin brought him to Asgard to be raised. Odin's wife, the goddess Frigga, acted as Thor's mother from that time onward. Not until many decades later did Thor learn that Jord was his birth mother. The Ragnarok cycle created numerous versions of Thor's origin story, and the fact that Asgard was a place of myth did not help matters when trying to keep track of all of the different stories and personalized descriptions of events. One such story came from the severed eye of Odin, which grew to great size, achieved sentience, and told Thor of another Thor who had existed before the current Thor's birth. This previous Thor was also the son of Odin, but had red hair, not blond hair like the current Thor. Thor was said in myth to have killed the Midgard Serpent, and to have been killed himself by the dying monster's venom, at Ragnarok, the destruction of a previous version of Asgard. Odin himself was killed, but a new Odin appeared in the place of several gods who survived Ragnarok, and it was this new Odin who fathered the current version of Thor. It is uncertain whether a true picture of Thor's origin will ever be told. The young Thor was raised alongside Loki, who had been adopted by Odin after Loki's Frost Giant father Laufey had been killed in battle. For all of their childhood, Loki was jealous of Thor. Loki's jealousy, which grew to hatred, resulted in a desire to kill Thor. Thus began Loki's enmity for Thor, which persisted for many centuries. For example, when Thor was eight, Odin sent him to Nidavellir, the land of the Dwarves, to bid the dwarf lords Brokk and Eitri to create three treasures for Asgard's ruler. Among the three treasures that Brokk and Eitri created was the Uru hammer Mjolnir (although Loki sabotaged the creation of the hammer so that its handle was made too short by distracting the dwarven weaponsmiths). Odin bestowed various enchantments upon the hammer, including one that made it impossible for anyone to lift it except someone who was truly worthy of wielding it. Odin then declared that he was reserving the use of Mjolnir for Thor, who would receive it on the day that great deeds of selfless valor had proved him worthy of its power. For years, Thor strove to become physically strong enough to wield the hammer, and was responsible for many heroic deeds. Finally, when Thor was sixteen, Odin sent him and his friends Balder and Sif on a quest to teach him what was truly required to wield Mjolnir which was a pure heart. Thor would soon becmme Asgard's greatest warrior. Before Thor was twenty, he had fallen in love with the goddess Sif. In fact, when Sif had been kidnapped by Storm Giants and ended up as a prisoner of Hela, Thor offered his own life in exchange for Sif's freedom. The goddess of death was so impressed by the young Thunder God's nobility that she let both of them go, and Mjolnir found Thor worthy to wield it. The romance between Sif and Thor waxed and waned over the centuries. Weather Manipulation: As the Norse god of thunder, Thor can summon the elements of the storm (lightning; rain; wind; snow) and uses Mjolnir as a tool to focus this ability. Thor can also create small tornadoes by quickly whipping his cape in circles. Asgardian/Elder God Hybrid Physiology: Biologically half-Asgardian on his father's side and half-Elder God on his mother's side; Thor possesses a number of superhuman attributes common among the Asgardian and other gods. Strength: In addition to being the God of Thunder, Thor is also the Asgardian God of Strength, as such he is physically the strongest of the Asgardian gods. Invulnerability: Being a god whose heritage is both half-Asgardian and half-Elder God affords Thor virtual invulnerability and immunity to such human ailments as diseases, toxins, poisons, corrosives, fire, electrocution, asphyxiation, and he has a immunity to heat and subzero temperatures and lead and radiation poisoning. Superhuman Abilities: He has superhuman speed, stamina, and senses. Thor can move at extreme speeds. His virtually inexhaustible stamina enables him to hold his breath for an undefined period of time, and exert himself at peak capacity for months without tiring at all. Superhuman sense's allow him to see objects as far out as the edge of the Solar System, and hear cries from the other side of the planet. Healing Factor: Thor is not invulnerable to all harm and it is possible to injure him. But due to Thors unique physiology he is able to heal from most injuries much faster than a human being could. Longevity: It is a common misconception that Thor and the other Gods of Asgard are truly immortal. Thor and the other members of his race do age but at a rate so slow that to other beings they give the appearance of immortality. Super Breath: Thor can use his breath to create hurricane force winds. Flight: Thor has the ability to fly and levitate. All-Tongue: When Thor speaks with the All-Tongue anyone who hears him will hear him speak their native language in their hearts. Indomitable Will: Thor has shown to have a powerful force of will, so much so that he has defied the will of his father Odin, who is his king and is bound to serve him, on several occasions if he feels the need to do so. He does not back down from any foe, does not give into a fight and is willing to lay down his own life in defense of others. Mind Resistance: Thor has the ability to resist the mental influence of powerful beings. He resisted a mind thrust attack of the Rigellians,the magical music of Ares, a mental attack from Glory, Morgana le Fay's attempt to dominate his mind, resisted the power of the Eye of Horus, and the mind blast of the Super-Beast. Multilingual: Thor knows and speaks all of the languages of the Nine Realms, Earth's dialects, and countless alien languages. Master Tactician: For centuries, he has lead Asgard into battle against overwhelming forces with great leadership and employing strategies and tactics from possibly every culture on Earth as well as all the Nine Worlds of Asgard, including forgotten ones. Leadership: Thor serves as the as the first choice to defend Asgard from it's enemies. He has earned the trust of his fellow Asgardians to follow him into battle. High Influential Connections: During his life, Thor has served Asgard as it's Prince and with this position he has had access to the wealth of Asgard, all the weapons and magical artifacts in Asgard and field command of Asgard's forces in Odin's stead. He also has good relations with gods from other pantheons. The Asgardian Hammer, Mjolnir: Thor wields Mjolnir, a hammer forged from Uru metal, whose chief properties are durability, the ability to maintain enchantment, and absorb energies. Mjolnir resembles more of a short handle mallet than a traditional warhammer. Mjolnir itself is already extremely durable like the Earth metal Adamantium or the Olympian metal Adamantine, and combined with the various enchantments placed upon it by Odin, is for all intents and purposes, indestructible. It has survived heat as extreme as the heart of the Sun, blasts powerful enough to destroy planets, and it has contained energy sufficient enough to destroy an entire Galaxy. When Loki attempted to use the Silver Surfer to defeat Thor, he tricked the Surfer into attacking Thor, Loki even augmented the Silver Surfers powers with his own, after which the Surfer said that he had never felt that powerful before. He also claimed that Thors hammer was far more powerful than his own Cosmic Power. To quote the Silver Surfer himself, I have seen his mallets magic, it is truly mightier than my cosmic force! Worthiness Enchantment: This enchantment surrounding Mjolnir prevents it from being wielded by anyone save those who have been found worthy. Thus far, this includes Thor, the Red Norvell, Beta Ray Bill, and Captain America. To anyone else, Mjolnir cannot be lifted from the ground nor wrested from Thor's grip. Those who are deemed worthy are abled to wield Thor's powers. Captain America said "I've never wielded such limitless power before!" "It's almost intoxicating!". As the true master of Mjolnir, Thor can also will unto others the ability to wield the mystical hammer, bypassing the worthiness enchantment, and also empower them with his own godly abilities. As long as he is alive, no one but himself is able to wield the hammer. Mystical Link: Mjolnir obeys Thors commands as though it were alive, and if Thors will is strong enough, the hammer can pass through nearly any barrier to reach him should he so chooses; Mjolnir will even carve its way through the very center of entire planets to get back to Thor. Mjolnir will even return to Thor while he is in his mortal persona as Donald Blake. Mjolnir can also transform Thor into his civilian guises. When Thor is a civilian, the hammer most often becomes an old wooden cane. While employing a mortal guise, Thor would transform back into his mortal form if he was separated from Mjolnir for more than 60 seconds. The 60 second enchantment is no longer in effect. Weather Control: Wielding Mjolnir grants Thor the ability to control the base elements of a storm, i.e. rain, wind, thunder, lightning and more. He can create giant raging electrical storms complete with thunder, lightning, hurricane-force winds, tornadoes, blizzards, tidal waves, exploding volcanoes, earthquakes and torrential rains across entire planets at a moment's notice. He can also create any of these phenomena individually. Another aspect of this power allows him to stop any of these weather conditions instantly as well. Thor can create storms on a planetary wide scale or larger if needed, and is not limited to the normal limits of Mother Nature and can go beyond and defy what natural weather can do such as creating rain in space where there is no atmosphere. Thor's ability to control and create storms extends to any and all storms as he has been shown to control and create raging temporal storms in time, create Solar Flares, powerful stellar winds in space and so on. Flight: Thor is capable of hurling Mjolnir with great force and, by holding onto the leather thong, is capable of flying through the air at tremendous speeds. 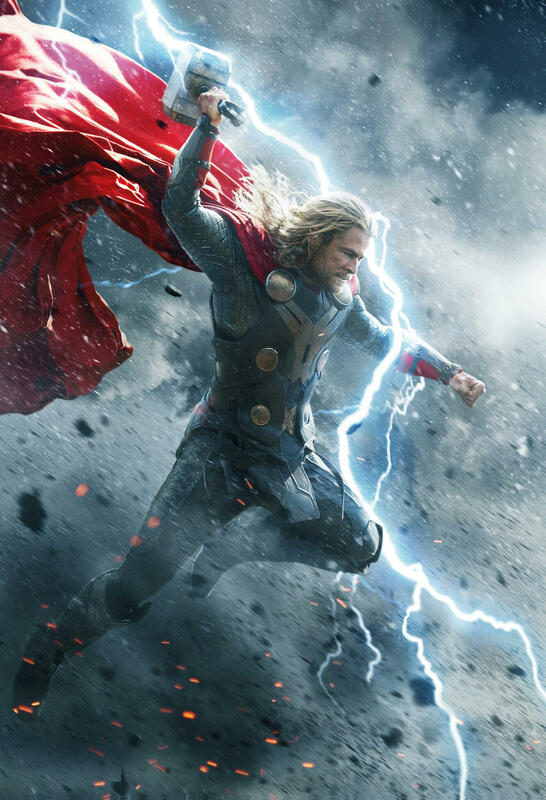 While in an Earth-like atmosphere, Thor generally flies at roughly the Speed of Sound, roughly 770 miles per hour. Thor can fly so fast that he is invisible to the naked eye. He has been clocked flying at three times the speed of light,and is capable of achieving speeds far greater than that. He can perform complicated maneuvers in the airand change course in mid-flight at the speed of thought.He can hover in mid air with the winds like Storm. Energy Projection: With Mjolnir, Thor can project powerful mystical blasts of energy. He can even channel energies for stronger energy attacks, most notably the use of lightning. God Blast: Thor is capable of channeling different amounts of his godly energies in combination with the mystical properties of Mjolnir can be channeled through his hammer for a single massive blast known as the God Blast which is able to kill even immortals. His godly energy is so vast and powerful, that even when reinforced with the Belt of Strength, which should double Mjolnir's fortification and durability, when Thor channeled his godly energies into Mjolinr to destroy the Brain Dome of the mighty Celestial Exitar, the hammer shattered from the amount of power Thor channeled. The God Blast is so immensely powerful and destructive that it has proven capable of destroying beings as large and as powerful as the Midgard Serpent and even causing such a great degree of damage to a being such as Galactus that he was forced to flee for his life.Thor can send the God Blast to the core of Ego the Living Planet and Alter Ego and render both comatose.He has also used the God Blast to defeat Surtur, Ymir, Juggernaut, and Zelia. Anti-Force: Thor is capable of producing an indescribably powerful blast known as the Anti-Force which is capable of annihilating entire planets. This blast is so powerful that with just a single emission, Thor was capable of putting down and seemingly killing the powerful entity known as Mangog himself. Thermal Explosion: Thor can generate an amount of thermal energy so powerful that it is able to defeat villains like Ego the Living Planet. Energy Sensing: Mjolnir can detect practically all types of energy.It reacts particularly strongly to evil psychic energy, and supernatural energy. Mjolnir can also track down the energy pattern of someone in hiding, detect any Asgardians aura by their electrons discharge,and can sense and track the energy radiating from mystical objects. Energy Absorption and Redirection: Thor is able to use Mjolnir to absorb any energy blasts directed towards him as means of attack. Once the energy is absorbed, Thor can redirect it back amplified many times over towards the source and/or use it as a weapon of his own. Thor has used Mjolnir to reflect the vast and hazardous amounts of energy being emitted by the biological weapon implanted within the Wasp's body by the Skrulls back at her while all of Earth's other super humans were helpless. Thor used Mjolnir to absorb Ultron's entire energy source, the Silver Surfer's Power Cosmic, Sky-Walker's Cosmic Tempest, radio active energy, magnetism such as Magneto's personal magnetic field and a portion of the Pangoria's planetary magnetic field. Mjolnir's ability to absorb energy is so powerful he managed to absorb, contain and redirect the entire energy of the Null Bomb, which was powerful enough to destroy the entire galaxy, absorb mystical energies, such as Pluto's mystic flame. He was even able to absorb a portion of the mystical energies from every god patheon on Earth,and absorbed the electromagnetic energies of the Celestial Mother-ship. Teleportation: By grasping Mjolnir by the leather thong and rapidly swirling it, Thor can channel energies for the purpose of opening gateways through means of a vortex and in this vortex time has no meaning, which means he and others can pass through it to their destinations instantaneously.He can open gateways which allow him to travel across locations no matter how great the distance within moments or even across entire dimensions, as he does when he travels from Asgard to Earth and vice-versa.Thor has used Mjolnir to rip the fabric of the Universe to send Surtur and Yimir to the Death Dimension and send an entire population to Limbo,Thor can also use Mjolnir to travel through portals anywhere within the same dimension. Matter Manipulation: By spinning Mjolnir in a precise manner at cyclotronic speeds, Thor can manipulate matter from a molecular level to a vast scale, which allows him to create other configurations and even allows him to transmute the elements themselves. This ability was evident when he transmuted the Absorbing Man's wood and iron body to the gas helium. Alpha Particles: Thor's hammer can harness Alpha Particles from the atmosphere and could use it to atomize any weaponry. Negation of Mystic Energy: He used this ability on the Juggernaut himself to negate the mystical energies that grant him his mystical invulnerability, allowing him to defeat Juggernaut in combat. He was able to stop Mephisto from taking human souls to the Dark Dimension. Nether World Power: Thor can use Mjolnir to tap into the power of the Nether Worlds (dark dimensions). Cosmic Energy: Mjolnir allows Thor to produce and control Cosmic Energy to an unknown limit for a variety of purposes. Raised to rule, Thor has spent his years as a warrior, fighting the good fight, defending the weak, and keeping the peace. He has had great success, and has been shaped by it, his mighty frame equally capable of strength as it is a casual arrogance, a bullheaded stubbornness with courage so endless that it borders on the reckless. In other words, a typical teenager. Yet his heart is pure. The God of Thunder strives to do no wrong but to right them instead. He will tell no lie, on his honor and his name. And it is a name he constantly seeks to live up to, to make the All-Father proud, to be the God that those around him expect him to be. In many ways, he is still learning. If he is ever to be more than half the King that Odin is, he must temper his impulsiveness, his reckless and foolish tactics, and rely less on instinct and more on tact and care. Headstrong: There is a stubborn streak within Thor, his endless courage forming an unbending backbone that has through the years led him to take actions that his peers have deemed reckless, bordering on foolish. When he believes he has the right of it, he refuses to yield, and this has put him at odds with those closest to him in the past. His recent banishment to Earth has tempered him somewhat, but at his core he is still a brutish warrior who acts more on instinct than strategy. Warriors' Madness: also known as the Sin Unpardonable. Warrior's Madness is the most forbidden malady in Asgard by law of Odin. Any who fall under it must pay the penalty, only the most bitter sacrifice can atone for it. Despite this allowing Thor to increase his strength and stamina tenfold, this threatens Thor's sanity. Symptoms include massive headaches, mentally erratic, savage, animalistic, uncontrollable behavior, and unreasoning. Honor: There is a code of honor that an Asgardian warrior must follow, and it is by these core tenements that Thor lives his life. His word is his bond. He will speak no lie. This is a way to exploit the God of Thunder, as any action he takes must be honorable. He will break no oaths, and subterfuge is beneath him.